"In a world full of hate and anger, LUV is stronger than any bullet." LUV Tank is a top-down shooter inspired by the Capcom classic, Gun.Smoke. Play at... Newgrounds or My Deviantart, right now. Eventually Luvtank.com . I'm proud to say that we did this in "spare" time in less than a month. Good times! Getting server problems right now, of all times. I'm leaving the country today so I've got no time to make everything pretty. 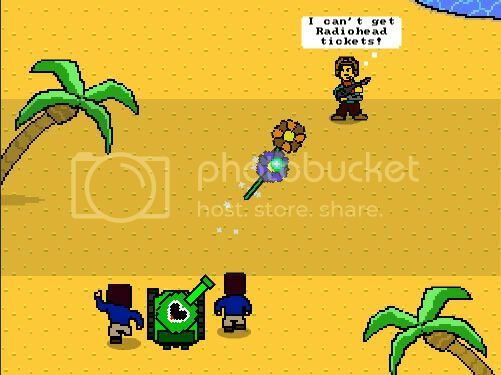 Great, I was hoping someone would make a shooter with flowers, really! Good the people say so much different things! The bullets are a bit vanishing in the coloured background, I think I would make them grey or so. Anyway, good message, good humor, good graphics, ok gameplay. Anyway, newgrounds isn't working for me, is that just me, or is it down? I’ll check out the game at the other link now. loved it very retro, very fun. First off, it looks fantastic - the 2 narative sequences at the beginning and end are great. The music also works really well. From the first look at the screenie, I wasn't sure if I wanted to give it a go, glad I did. I like the ingame loop and although it was quite short, it wasn't intrusive. ... and it's very retro, indeed. On the downside: I just played if for too long and now espresso is cold :| thanks. Love the old C64 loading and wicked sprites. Post you game for free at Gamestack.org. We send the user straight to your website, no iFrames or other leeching methods. Please check out Gamestack.org for more information. Without having a religious, very principal, scientific proven or maggie simpson a-like opinion on this, I think you could say that violence in videogames is excessively (eng.?) used. Than if you start to wonder how to make a nice shooter without the bullets, you quickly come across the idea of flowers I guess. I would be one of the "student loan" guys, and after you shoot me i'd be the one that sings "que sera sera"
Very nice game dude. I love the style of the game. It's nice seeing that your doing good in the world rather than killing. With this game every day is a valentine day! Reminds me a bit of Peacetank? I see. I was just a bit shocked that the hierarchy of projectiles went bullets>flowers... but thanks for the explanation. argh!! i hated it!! im SOO ANGRY!! this is the best game ever!! I kinda wish it was longer, but doing that in only a month I don't see how it would be possible to make it any longer. At any rate it's really good.